These are the municipalities documented to have Totonacan Indigenous peoples. The Totonaca are a located from the Gulf coast in the southeast part of the state of Vera Cruz to the Sierra Norte of Puebla. Their territory was once a large empire called the Totanacapan. The climate is hot and humid on the gulf coast region and cool in the highland of Puebla. Today there are approximately 250000 Totanacan people. 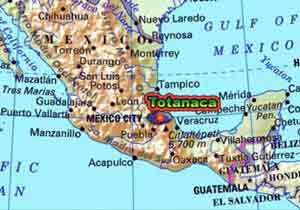 The Totanaca language is classified as Maya-Totanaca group, Totanaca branch, as well as the Totanaca family. There are a number of dialects not mutually understood by other peoples in the language group. In many areas of the Sierra of Puebla both Nahuatl and Totanaca are spoken. In the regions where the Tepehuas is spoken, there are some mixed marriages between the groups. The economic activity is generally the same as other groups, predominantly agriculture and handicrafts. Livestock is also raised for food and trade. The traditional belief systems are blended with the Catholic, but the traditional belief systems continues be important in the harvest cycle. In some Sierra regions, children are believed to share their existence with an animal helper or "tono".